Can we use the healthy stems of already grafted rose plant to have another plant but with own roots? I'm from India and English roses are available only in grafted form here. 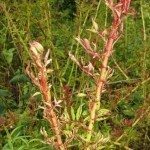 So thought to know about growing new plant with own roots from the cuttings of healthy stems of grafted rose plant.